The atmosphere and excitement of this great physique show at Wembley, England is captured. See USA’s Mr. America winner JEFF KING as he overcomes the major challenge from JOHN BROWN in his class and goes on to win the overall title against class winners VINCE BROWN and TERRY PHILLIPS. Excellent quality considering its age. The NABBA Universe was known as the greatest physique show on earth. As well as the Mr. Universe was the NABBA Miss International Open Bikini Class (which was its correct name back then), really like the figure class of today. The atmosphere and excitement of this great physique show at Wembley, England is captured in it’s entirety. See USA’s Mr. America winner JEFF KING as he overcomes the major challenge from JOHN BROWN in his class and goes on to win the overall title against class winners VINCE BROWN and TERRY PHILLIPS. From build up – when you are taken behind the scenes to watch the competitors in preparation, to some useful tips, and competitor profiles – to prejudging and meeting the winners. Includes an interview with defending champion John Brown. See the late ED KAWAK as he defeats Scotland’s IAN LAWRENCE and USA’s RUFUS HOWARD after a titanic battle in the Pro division. Behind-the-scenes activity, how the competition is judged, presentations to the finalists and interviews with the winners. MARY SCOTT of Scotland was a narrow winner in the Bikini Class over Australia’s BETH LOPEZ. 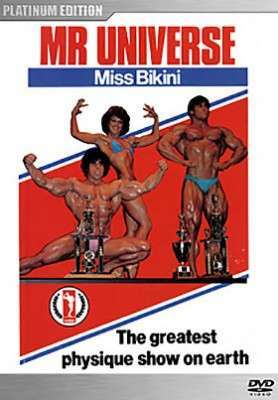 For all bodybuilding enthusiasts, lovers of competitions or current competitors, you’ll find the classic 1983 Mr Universe and Miss Bikini contest compelling viewing.